Team representatives and vendors showcased some of the new food and drink options coming to Nationals Park this year, including specific plans to use only compostable and recyclable food/drink packaging. And a new program to install 4,080 solar panels (working with WGL Energy Systems) that will provide 10% of the energy that Nationals Park uses. Pretty cool sustainability initiatives by the Nationals. We’ll take a peek at the food and drink later, but now for something completely different. 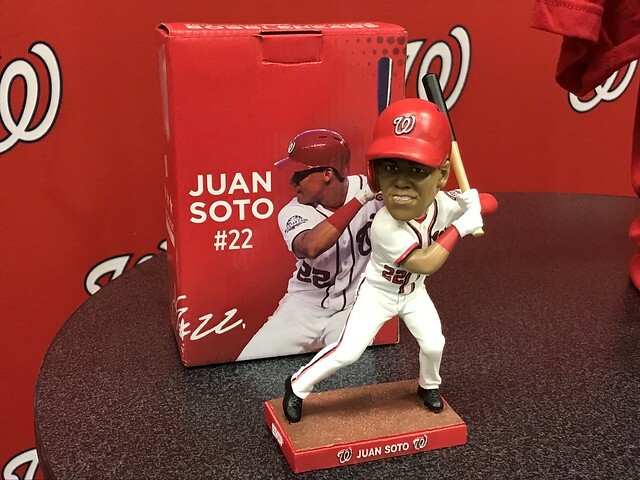 This year the Nationals are upping their game, and releasing eight bobbleheads throughout the season. That’s legit. 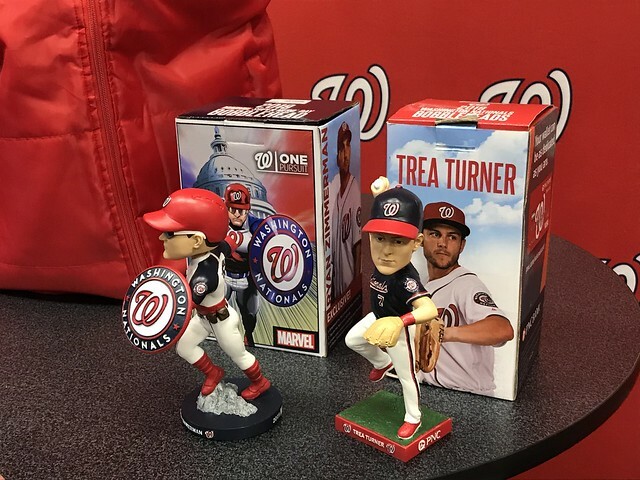 The first 25,000 fans to each of these games, scores a Nationals bobble to add to their collection. You need new ones to replace your Harper bobbles, right? Friday, June 21 – Max Scherzer Bobblehead (Pro tip: Max had maybe the best season as a pitcher last year (but can’t take anything away from deGrom winning the Cy Young with his amazingly low ERA). Max is incredible and I predict another Cy Young Award for 2019. The first 10,000 fans to each of these games, gets these two extra special bobbles. The Nationals will also feature five (five!) games with fireworks, a lumberjack hat, a beach bag, a puffy vest, and the ever popular annual Oktoberfest Beer Stein, among other things. Pups in the Park returns six times, and there will be multiple College Days for local universities/colleges. 14 College Days to be exact. See below. See the full calendar of promotions and special nights and get your tickets here.